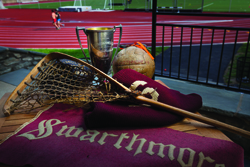 Since 1878, student-athletes at Swarthmore have proven that it is possible to excel in the classroom and on the field, earning All-America honors, winning national championships, and even starring in professional sports leagues. Now the accomplishments of the College’s most exemplary student-athletes, coaches, and teams will be enshrined in the newly created Garnet Athletics Hall of Fame. The inaugural Hall of Famers will be inducted on Friday, Oct. 26, during the annual Garnet Weekend. Inductees will receive Hall of Fame certificates at a special on-campus dinner that night and be further honored during halftime of the Swarthmore-Haverford men’s soccer game on Saturday night. “We are very excited to celebrate the exceptional performances by Swarthmore athletes and teams throughout the history of our athletics program,” says Adam Hertz, Marian Ware Director of Physical Education and Athletics. Heather Kile Lord ’02 (basketball, lacrosse), a four-time all-Centennial Conference performer in basketball and the program’s all-time leading scorer. Eleanor Kay “Pete” Hess, the longtime lacrosse and field-hockey coach and advocate for women’s athletics who died last winter, was the coach chosen for the inaugural class. The 1984-85 men’s tennis team, which captured the NCAA Division III national championship and featured five All-Americans, rounds out the class. According to Hertz, the idea for an athletics hall of fame was proposed several times in the last few years but finally came to fruition in summer 2011. Since the creation of the Hall of Fame was announced last year, Swarthmore community members have submitted more than 100 nominations. Future classes of the Garnet Athletics Hall of Fame will feature at least six inductees, providing ample opportunity for the College’s most recognized student-athletes, teams, coaches, and administrators to receive their deserved spot in the hall. “We look forward to many more nominations and many more years of Swarthmore athletics excellence being celebrated in the Hall of Fame,” says Hertz. With 134 years of athletics history to consider, that shouldn’t be difficult. 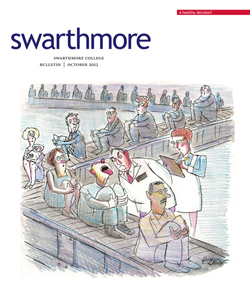 For more sports, go to Swarthmoreathetics.com.